Guests enjoy free internet access and in-room coffeemakers and microwaves at Red Carpet Inn & Suites Beaumont where parking is free. Cable TVs with HBO are included in all 100 rooms at this single-story hotel as are microwaves and coffeemakers. Keep on top of business with free internet access. Non-smoking rooms are available. 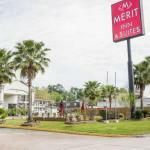 Additional conveniences include a coin laundry and a 24-hour front desk. Pets are allowed and parking is free. The hotel is located off I-10. Travel two miles to take a tour of the McFaddin-Ward House built in 1905. The Beaumont Convention Center is two miles away. Take your pick of entertainment and dining options in the Crockett Street Entertainment District three miles away. Lamar University is seven miles away. It's 16 miles to Southeast Texas Regional Airport and 96 miles to George Bush Intercontinental Airport.